When most consider of the term “commercial mowing” it’s natural to think in terms of large areas and how to get it done as quickly and efficiently as possible. At Ever-Green, efficiency is important, yes. But large areas of turf also mean bigger opportunity to promote the very ideals on which our company and our reputation was built. That being, it’s important that commercial mowing look as good, or better, than any other work we do. And the reason is because so many people see it. Well, obviously Ever-Green uses the best in state-of-the-art equipment. And obviously our personnel bring years of experience to every job. We answer, “Yes, and with pride.” Pride is the final element! 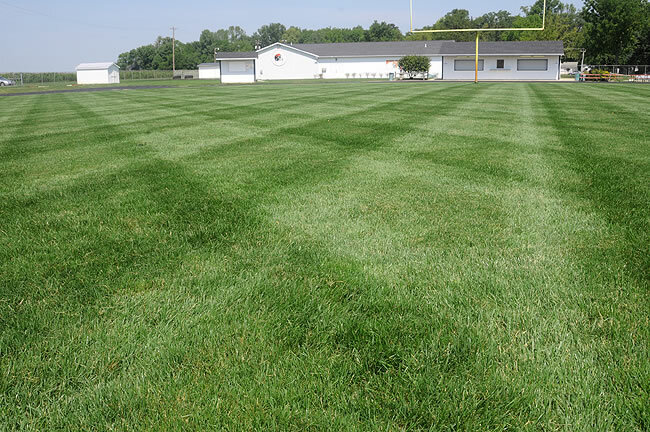 Athletic fields, like Arcanum High School’s outstanding football facility (shown here) are just one of our commercial mowing services. But the focus is on more than cutting the grass. The Ever-Green goal is to “improve” with each mowing. "We're pleased to have Ever-Green as the caretaker of our varsity athletic fields at Newton High School, and with their overseeing our new soccer facility it promises to be one of the best natural playing surfaces in the area come this fall. We recommend their work and services highly."